Here's a few press excerpts for Junction City Music Hall. "Probably the most fun you’ve had in a basement since high school. Junction City Music Hall has all the correct ingredients for a great night out. Low pretension and high-caliber talent on stage – it’s where you’ll probably see your next favourite band for the first time. Featuring a great selection of cold craft beer, vintage arcade and pinball tables as well as good folks on both sides of the bar, Junction City Music Hall is the neighbourhood’s first choice for an awesome time." 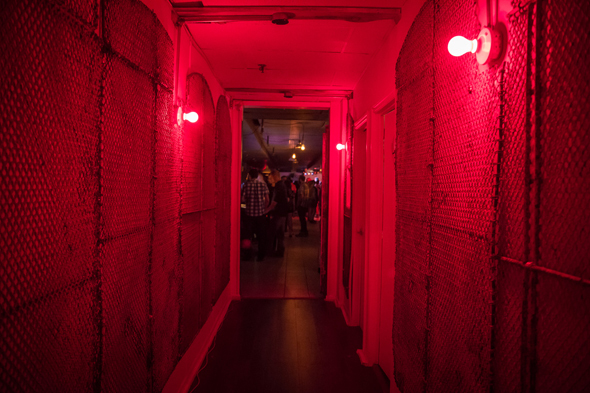 "To reach this clandestine hangout, visitors have to travel through a hidden door, along a narrow hallway and down a set of stairs. At the bottom is a kitschy basement dive done up with retro arcade terminals, reclaimed signage and twinkly lights. The music is as eclectic as the decor: audiences can cozy up in booths at folk shows, dance into sweaty oblivion during DJ sets or belt Taylor Swift at karaoke nights." "Another basement-level secret is Junction City Music Hall, a concert venue with all the fixings a good bar should have. It's accessed by way of a steep staircase just off Dundas Street West and - bonus points! - is not too far from Hole in the Wall, in case you're doing a secret-bar crawl." "Locals onstage and on tap – as are the themed cocktails – this well-kept secret in the city’s west end is a cozy, subterranean watering hole where you can take in area indie veterans like By Divine Right in a low-key environment then dig into vintage pinball and arcade games between sets. On Tuesday nights, bands go home with multi-tracked recordings of their performances as part of the hall’s Tuesdays to Tape series."